A 16-year-boy has been detained for four years for killing a shopkeeper who refused to sell him Rizla papers. 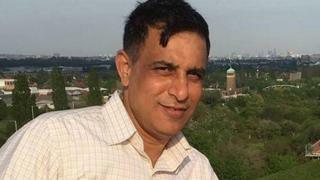 Vijaykumar Patel, 49, suffered a "catastrophic" head injury when he was attacked outside the minimarket where he worked in Mill Hill, north London. The youth, from Brent, said he acted in self defence but was found guilty of manslaughter at the Old Bailey. He was given an extended sentence of four years' detention and a further three years on licence. The court heard the teenager, who cannot be named for legal reasons, had five alcoholic drinks at a party on 6 January. That evening, he and two friends went to the shop to buy cigarette papers but they were sent away for being under 18. The defendant then became aggressive and shouted abuse before he "launched" himself at Mr Patel, the jury was told. The 49-year-old was found unconscious and bleeding in the street. He was rushed to hospital but died the next day from an injury to the back of his head. The court heard the boy, who has ADHD and low intelligence, had previous convictions for possessing weapons and kicking and punching a teacher at his school. At the time of the killing, he had been on bail and was in breach of a curfew. Mitigating, Philippa McAtasney, QC, said the teenager was "not beyond hope and help" and had used his "best handwriting" to express his remorse in a letter to the judge. However, Mr Justice Stuart-Smith described him as a "time bomb" who had a "very high risk of causing significant harm."